There's a trending topic on Twitter called #translationthurs (brainchild of Winston's Dad blog). If that sentence means nothing to you then just know that there are people out there who want to shout from the rooftops about literature in translation and a few weeks ago I recommended this novella from new publishing outfit Peirene Press. Peirene was a Greek nymph who turned into a water spring, from whence the poets of Corinth drank to receive inspiration. Metamorphosis is a fitting emblem for a publisher dedicated to bringing translated literature to an English audience and Peirene's motto - "Bored watching films? For a fascinating night in: Sink into a two-hour book!" - makes clear that these are all books of less than 200 pages (Beside The Sea is just 120 pages), novellas to be enjoyed in a single sitting instead of watching the latest monstrosity from the Cowell empire. The first of these is a tale of a mother who decides to take her two sons, Stan - nine and Kevin - five, to the seaside. I mentioned in my review of Room that it was this book that had pointed up to me the big weaknesses of Emma Donoghue's much hyped, Booker longlisted novel. The fact is that in a far shorter work Olmi writes completely convincingly about someone alienated from the world they live in and about a mother's desire to protect her children from harm, two of Room's major themes. She does this with a simple narrative voice, without a grand concept and the book is all the more effective for it, with the final few pages delivering a dénouement that hits you right in the solar plexus and left me just a little devastated. After my complaints about the narrative voice employed in Room I should say that I had similar fears at the beginning of this novella. The simplicity of the sentences, their short length, the fact that they were often reporting simply the chain of events, I was concerned that this was going to be a case of flat prose occasionally enlivened by incident or turn of phrase. But the style, conveyed brilliantly in an excellent, fluid translation from Adriana Hunter, is perfectly suited to this mother who it transpires is on psychiatric medication and struggling to cope with even basic tasks. In the morning I don't have the strength to get up to go to school, it's Stan who takes Kevin, and I think the littl'un likes it. With Stan I'm never late, he told me once. Schools open too early. Ten o'clock would be good. I can't do anything before ten o'clock. I don't sleep well at night. It's the worrying. I couldn't tell you what about. It's like something's been lowered onto me... like someone sitting on me, that's it. No one even notices I'm here. They sit down on me like sitting on a bench. I'd like to get up, stand up, thrash and scream. Nothing doing. They keep on sitting there. How can anyone understand that? The language remains simple throughout and the sentences run into each other with very little punctuation to separate speech for example, all of which helps to give a sense of her mental illness and adds to the rhythm of inevitability. There is a desperation to this journey, she wants so much from it and also feels the need to protect her children from what they encounter whether that be a shabby hotel room, the mockery and hostility of other people, or even the very thing she has brought them to see. The sea had lost all its colour, it wasn't blue at all, it looked like a torrent of mud, it was the same colour as the sky, what I mean is even the beach was like the hotel: same feeling of being in a cardboard box. It's completely blue, really, I told Kevin, but it was making such a row he didn't hear me - maybe I didn't actually say it, maybe I was talking to myself, It's breathing very loud! Kevin shouted, tugging at my arm. Don't be scared I said, it's just saying how glad it is to see you, it's really missed you! Does it know me? The whole world knows you, Kevin, that's what I wanted to say, the whole world's waiting for you, but that was wrong, I know there's no one waiting for us. But aren't we allowed to lie every now and then, to turn ourselves into fairies, children expect it and it gives them a chance to dream, what's wrong with that? That need to protect is incredibly powerful - 'maybe it's an animal thing, it's stronger than us', and it is that that gives the tale its tragic quality. Not only has she invested so much of herself in this trip but with her collection of centimes it seems that this is a journey heading in only one direction. Her embarrassment and shame at having let down her children in the past and the way in which this trip fails to atone for that in any way actually help us to sympathise with a character who, even as we read, takes appalling care of her children. How does the book manage not to be a completely depressing read? Well, that's the trick, I suppose. Olmi's characterisation of her mother figure, the stoic and time-worn reactions of her children and the vast effort to make things work, to be normal and happy are a few of the aspects that help. Another major factor, and the one that I found lacking in Room, is that it uses its protagonist and their view onto the world to illuminate our understanding of it. It isn't about grand revelations but small observations and that they come from someone on the margins, or indeed excluded from normal society makes them all the more relevant to the reader. We could quite easily be one of the people to glance sideways at this harassed looking mother, passing judgement as she pays for her drinks with small change from her pocket. It wasn't so nice after all in that cafe, and I couldn't wait to get out. I can't seem to stay in the same place for long, there's always something that upsets me or makes me sick. Usually people make me sick. I wish they could be more like kids: with more questions than answers, but it's often the other way round, where did they learn to be so sure of everything? Olmi so successfully gets us into the mind of this mother that we feel sympathy where others show disgust and even manage to maintain it as the story moves towards its horrifying conclusion. I really can't recommend it highly enough, or commend Peirene Press for not only making it available in English for the first time (despite being published to great acclaim in France as long ago as 2001) but for making such a finely produced edition. French flaps, quality paper and elegant design make this a book with as much to admire on the outside as within. I look forward to reading the other books in their catalogue (and to the publication next year of a work translated by Anthea Bell). I've been meaning to get another Peirene, and you've just persuaded me this is the one to get. Thanks William, a nice review. Glad you liked it too Tom, it's a super little book isn't it? I'd love to hear your thoughts, Max, when you've had a read. I "enjoyed" (if that is the right word) this book when I read it earlier in the year, too. For such a short book that's written using simple prose, it really packs a punch, doesn't it? You really get inside the mother's head, her whole weary-with-the-world attitude and her desire to do best for her children. But somehow in all that the writer manages to convey that the mother is seriously f**king things up and that she's mentally unstable. It's precisely the differences between the two books that make them perfect for comparison, I reckon. Whatever the perspective, plot or approach these novels share two major themes. Alienation from society is the constant state for the mother in Beside The Sea and what Ma walks out into in Room. The first book describes an alienation that a lot of readers will be able to relate to, whether by identifying in some way with the mother or by recognising her like one of the people she encounters in the book. The extraordinary setup of Room makes it difficult to identify with it personally as it's so far removed from anything most of us could have experienced. The second theme, how far a mother will go to protect her child, is there at the very beginning of Room and the very end of Beside The Sea. 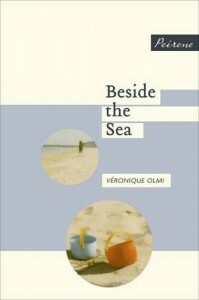 As you say, the two books have very different endings, and the weird thing I think is that Beside the Sea seems like a piece of realism but ends up almost like a parable, whilst Room does almost the opposite. If I had to choose between them I'd take the horror of the former every time. I feel like I've learnt a lot more about 'us' from that book. Oh, I agree. I preferred Beside the Sea in terms of teaching us about ourselves and about developing empathy for people you might simply turn a blind eye to in the street. When I was reading this book two stories (about mothers killing their children) hit the headlines. One of these incidents happened in a hotel room, the implication being she had taken her children away on holiday, perfectly replicating the story of Beside the Sea Instead of condemning her, as I may have done in the past (why didn't she get help, how selfish to take your children with you when you die etc) my first thought was how very sad and desperate she must have been to carry out such a horrendous act. I think that's the beauty of reading fiction, to learn empathy for people in situations far from your own circumstances. Happy Birthday to ... me!